For an unpretentious and unassuming “beater” watch that still has some elements of vintage-inspired military design, these “Vietnam Style” quartz watches are probably the best deal on the market right now at $32.99 (with free shipping in the US even). Especially when other efforts at these sort of mil vintage homages like the Hamilton “Khaki” line cost hundreds and even the J. Crew Timex “Military” watch comes in at around $150. This inexpensive and unassuming “homage” watch is quite comparable in terms of performance, quality and faithfulness to vintage aesthete and at a fraction of the price. What’s not to like? 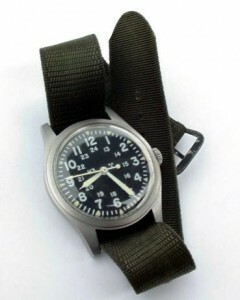 Hamilton MIL-W-46374 US military watch, circa 1978. Photo: Hyunsuk. It was patterned after US military watches of the 1960s and 1970s made to the MIL-W-46374 family of specifications, but includes some updates like the addition of a calendar function and a larger 42mm case 42mm case that will appeal to modern tastes. There’s a lot to like about this watch: a full stainless steel case, a respectable 5 ATM (50m) water resistance rating more than adequate for everyday use, and a quality Swiss Ronda quartz movement with a 3-year battery. In this respect the watch will drastically out perform its more humble mechanical ancestors as far as timekeeping performance. And just like the originals, there’s no branding or unnecessary gingerbread print cluttering up the dial. 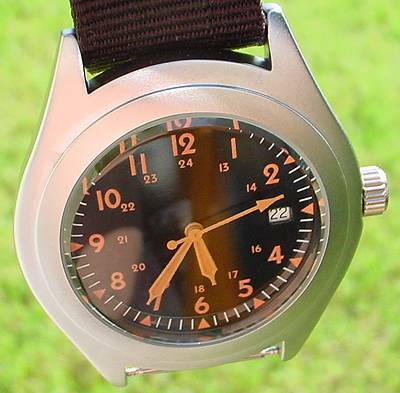 "Vietnam" Quartz Field Watch. Seller's photo. 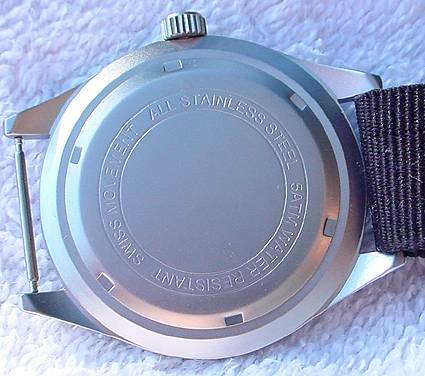 "Vietnam" quartz field watch caseback view. Seller's photo. "Vietnam" style quartz field watch, crown and black G10/"NATO" nylon strap. Detracting factors might be that the dial and hands are lumed with an odd-looking salmony orangy tint luminova (perhaps an attempt at achieving an “aged” look?) and that the hands are just slightly undersized for the dial. Ideally in a well-designed watch the minute and sweep seconds hand should reach the index markings for greatest ease of reading, but I’m finding it pretty easy to forgive such minor shortcomings at this price point. 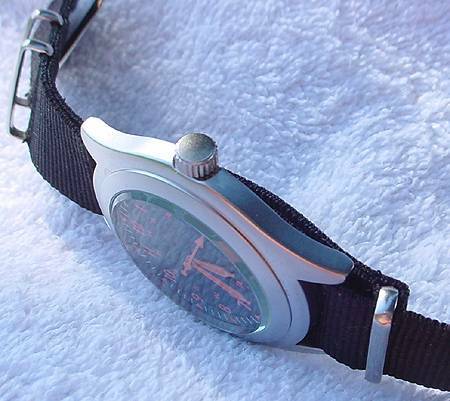 It comes on a black G10/”NATO” style strap that is arguably incorrect on a watch patterned after US military watches, but the style is well-liked by collectors and other modern re-interpretations like the J. Crew Timex mentioned above do the same.